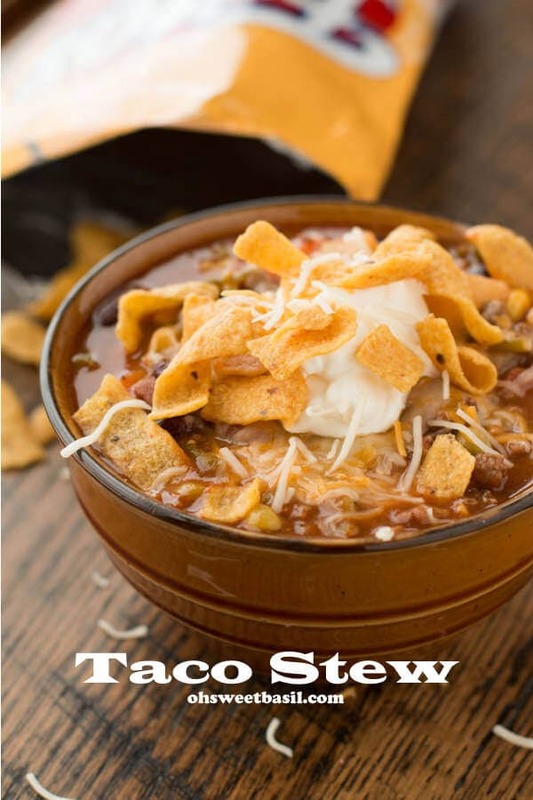 This taco stew is the recipe most requested by anyone who knows my mom and now you can try it too! I beg you try this and you won’t regret it! Remember how we took that awesome trip to celebrate my sister’s graduation up at Teton Springs? Well, it wasn’t just the trip to the cabin that was awesome, we had a ton of delicious and amazing food too. We started our trip with some brown sugar apple dip, and ended it with this Taco Stew that is unreal! It’s seriously a favorite in our house. 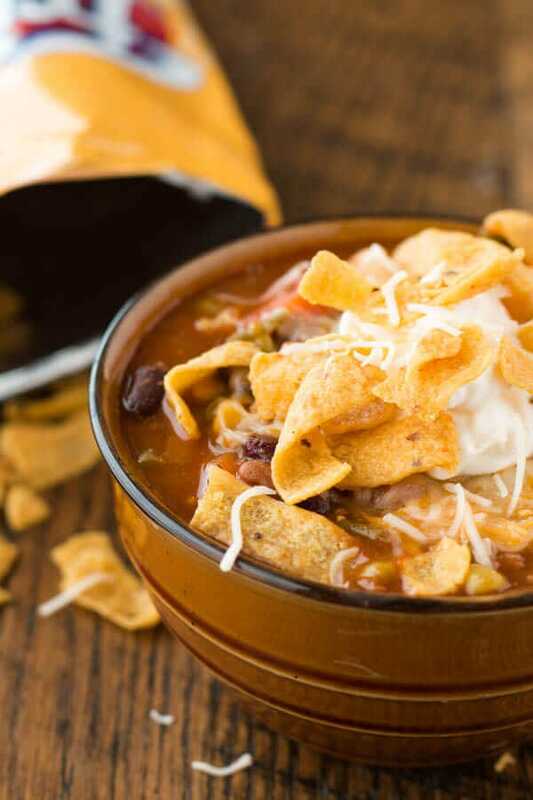 There’s something about the Fritos and the soup. I’m serious. I never and I mean never think to buy Fritos but they are a total necessity for topping off the taco stew. I think it’s that crunchy corn taste that works so well with everything. We had a full day of “sledding” as they say in Idaho or snow mobiling to the rest of the world, thanks to my sweet Dad. He is such a kid at heart and loves to do things for his kids and grandkids. In fact, I’d even say that his grandkids have his heart even more than the rest of us and trust me they love him just as much as he loves them. It was so much fun to go flying up the mountain and look at the amazing views. If you haven’t ever been you are totally missing out, but I insist you be so careful. They are still easy to get hurt on. 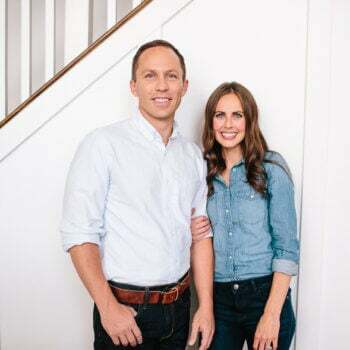 A few years ago my sweet friend Cortney lost her husband, Nic in an avalanche while sledding and while he wasn’t doing anything dangerous, in fact he was saving someone’s life, it hit me hard just how tender life is and that we can have it taken away at any time. Cortney was one brave woman with a new baby and two other tiny children and has been such a great friend to me since college. I can’t wait to find an opportunity to be in the same place and reconnect one day. Maybe even over a big pot of this famous taco stew. My mom always uses Russet potatoes for stew but I think that’s just because we bought them cheap for baked potatoes etc. Russet potatoes are not a good potato for soups and stews as they end up a bit mealy in texture. Choose red or golden yukon potatoes when making a soup or stew as they have a different amount of starch so your potatoes will be soft and creamy and not crumble in the soup. You can use any cut of beef for a beef stew, round, chuck roast, chuck shoulder etc but in this taco stew recipe we stick with ground beef to give that taco flare. Can Stew be Left Out Overnight? Stew cannot be left out overnight. To store stew, place in an airtight container and allow to cool almost completely then place in the fridge for up to 5 days. Yes!! Stew freezes really well! Just cool the stew completely and place in freezer bags or snag yourself our favorite Food Saver. Stew can be frozen for up to 2 months if you’ve pressed out all of the air and sealed it properly. In a large pot add a drizzle of olive oil and place over medium heat. Cook the onions until tender, about 3 minutes. Add the carrots and potatoes and add just enough water to cover them. In a separate pan, over medium heat cook the hamburger, drain the grease and add to the water and tender veggies. Add all of the remaining ingredients and cook until heated through. 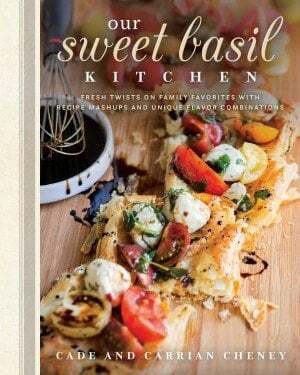 Serve with shredded cheese, sour cream and fritos! 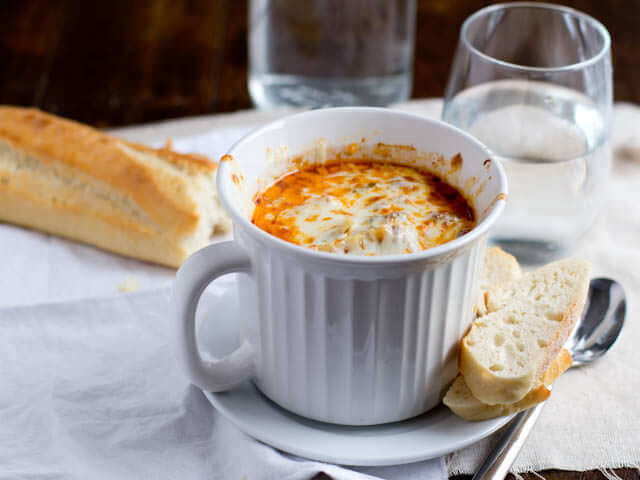 There are a lot of lasagna soup recipes out there but I truly think this one is the best of the best. There is not a single person in our family that doesn’t love this soup and with kids involved, that’s saying a lot! 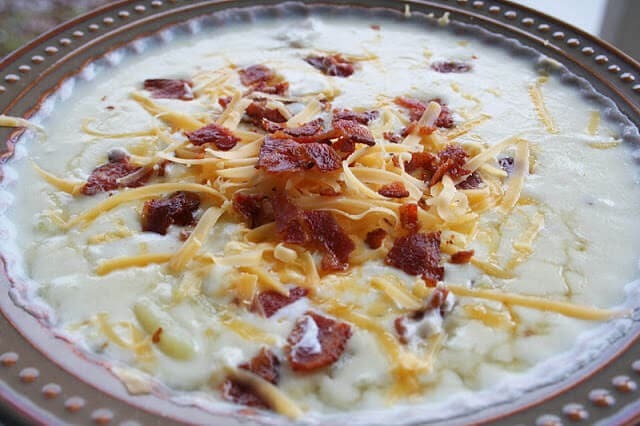 Everyone who makes this potato soup never tries another version again. It really is the best thanks to a few secrets. So you think you love chili? 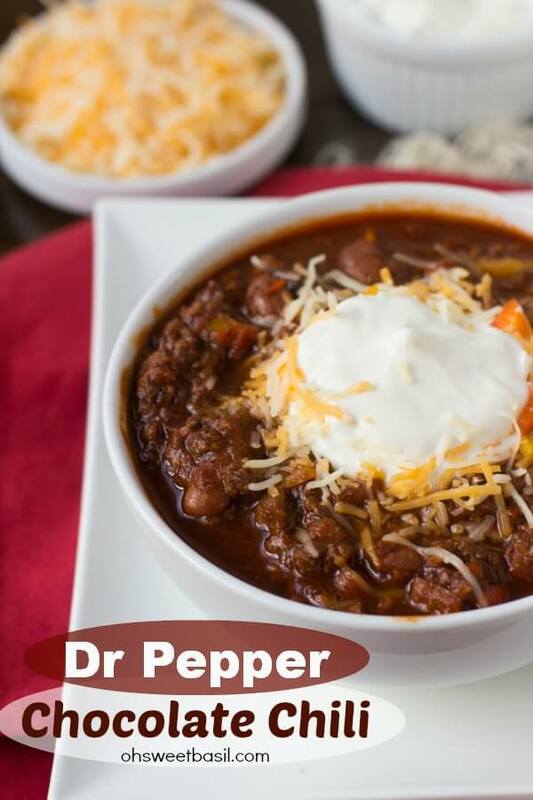 But have you had chili with chocolate and Dr Pepper? Courtney, so happy to hear that you enjoy it and yes, the fritos are a must! Thank you! Can’t believe I haven’t left a comment until now. 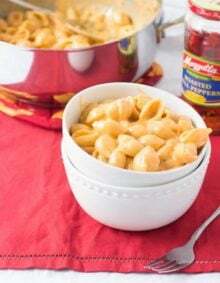 I found this recipe last fall and have made it at least 4 or 5 times this winter. 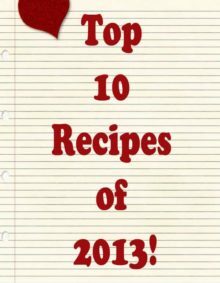 It’s a great recipe as-is, or to mix up with additions/deletions. No kidney beans? Use pinto beans? Don’t like canned green beans? Leave ’em out! Make it mild, make it spicy. It works on so many levels. This is a great recipe…thanks! Rita, yes!!! That is exactly why we love this recipe, you can do anything you want with it! Thank you so much for the great comment! Have made it for supper. Have not had it yet. See if my husband likes it tonight. I’m crossing my fingers so hard that he does!! Is the can of tomatoes “stewed”? I’m so glad! It’s one of our favorites as well! I’ve made this recioe as is 2x over the past year. It’s very easy and everyone loves it. It is so delicious with the fritos, sour cream and shredded cheese. Yum!! Thanks Sandy! I don’t know why but those fritos really are so good with it! This soup is delicious! I make it all the time. Thank you so much Bella! Made this last night! It was lovely for a chilly night! I shared this on my blog!! So glad you liked it and thank you for sharing! Just wondering if anyone has tried making it in a crockpot? At what point did you add everything to the crockpot? And, how long did you cook it for? Hi Samantha, this soup freezes quite well. 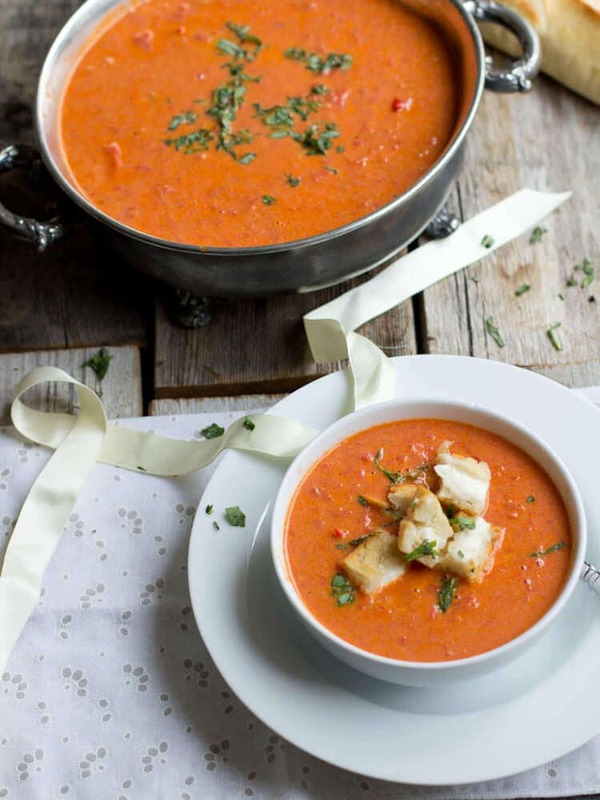 Just make sure that any dairy is added upon serving (cheese etc) and not stored with the soup or it could curdle. 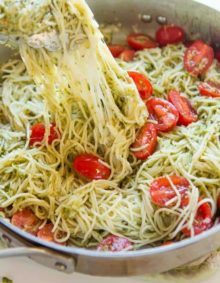 Really like that this recipe incorporates veggies and is still a favorite at my house!. I leave out the peas and kidney beans since my girls don’t care for them. I use a small bag of frozen corn and green beans instead of the canned and microwave them at half the time on the package before adding. Also add a half jar of medium salsa to give it a little more tomato sauce and some kick. I love the salsa addition! I’ll have to try that! I made this it is hearty and very very good, the family loved it, will be making it again, thanks for the recipe. I’m so glad! Thank you Rose! I have the same question as Barbara, what are chili beans? I went to several stores and was pretty much told there is no such thing I used Hormel chili with beans but not sure that’s what you meant. Came out excellent anyway! Lisa, I think the store people probably missed it. It’s an easy mistake. Bush’s Beans and S&W make them and I’m positive that Walmart and our two local grocery stores carry them, not sure where you are. They are right by the kidney, pinto, chili section. It really is so easy to miss as there is usually just one small row. 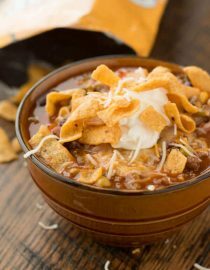 Attempting to make your Taco Stew – what are Chili Beans? If you could let me know, it would be much appreciated. Thank you :)! Looks good but, what size can of tomatoes? What type? We just use regular cannedt omatoes but you can play with flavors and types. We use 16 oz can. sounds good except for green beans and chili beans together..we dont eat kidney beans, so we use pintos or chili beans with pintos….and we love green beans..just not together. ( and not crunchy) .but then i live in the south..just not a southern thang…. I actually thought I wouldn’t like it for those very reasons but it works so well I love it! Don’t worry though, you can easily substitute any of the beans for ones you love. This was a hit! I got my husband and 11 year old son involved with peeling and chopping the potatoes, carrots and onions. I did add a second package of mild chili seasoning (this is all I had), as I thought it could use a little boost in flavor. We loved it! Thank you! This is perfect for these cold days! 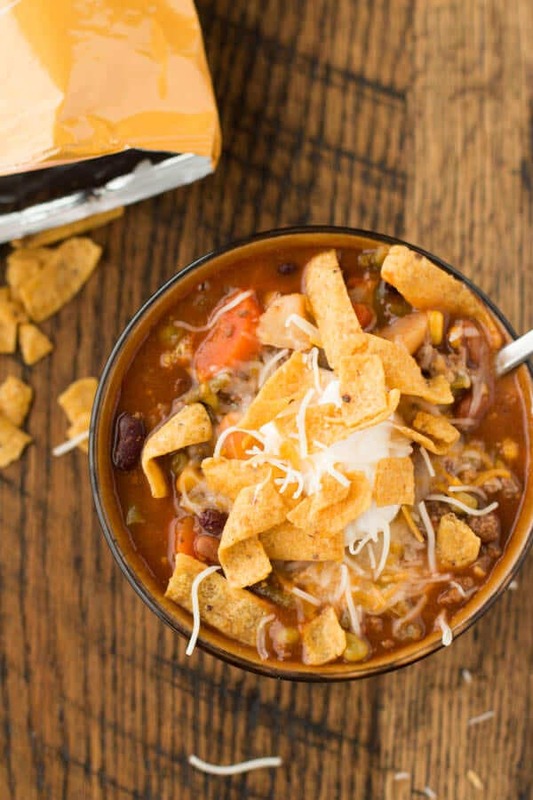 It’s such a different “taco” soup and not my norm but we adore it! What an amazing sounding stew! Perfect for warming you up from the inside! this stew looks amazing!! and i love the frito topping. 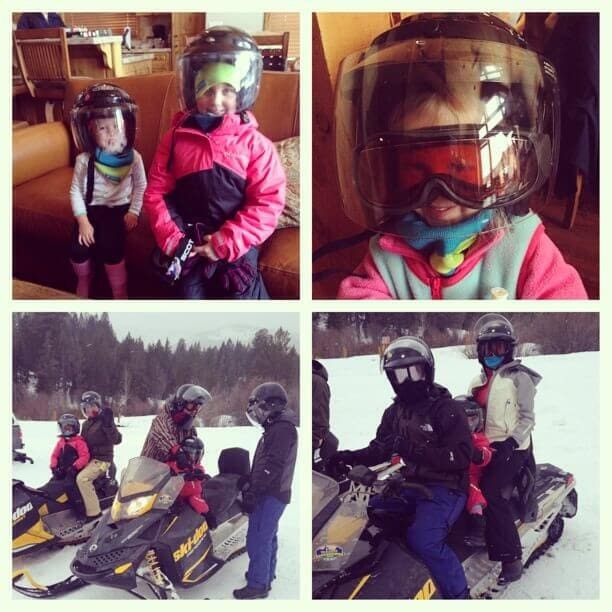 Those photos of sledding are just too cute! What a delicious looking stew! My kids would LOVE it for sure! What a fun trip. I love taco stew in the cold months. Warms you up from the inside out! I’ve been snowmobiling through the Rocky Mountains and it was spectacular! Your soup looks a.m.a.z.i.n.g.! Thanks for sharing!!! thank you!!! I can’t wait for my mom to see the sweet comments! I love Fritos! They are a bit of a guilty pleasure:) Just made a Mac and cheese with Frito crust. What a great idea for a stew – tacos! WHAT?!!! I didn’t see that. Is it on the blog? Jeepers, going to look right now! What a fun day! My family love “sledding”. I loved seeing your photos of the girls, they are so cute!! And this soup! Amazing! It sounds delicious! Your day of “sledding” looks so fun! I am sorry to hear about your friends hubby, you are right life really is so fragile. On a lighter note…this stew looks deeeevine. I can totally see where it would be super duper requested. I love anything that requires me to top it with chips!